Ready to unleash your inner design diva this year? When most people talk about a new year and new goals (I’m totally avoiding the word resolution here! ), they tend to focus on really big achievements. But sometimes the smaller things have a greater impact, and are more attainable. Your home is a reflection of you, and you want it to look good; we all feel better when our surroundings are great. 2016 is the year to declare that your environment matters, your home matters and design matters. So put it on your must-do list, and join us on a fabulous journey to make this your best design year ever. On this first day of 2016, I’m going to share some things I’ve done in my home recently that have really had a big impact, without spending a fortune or a ton of time. These are things that really anyone can do. I grouped them into four big, important categories: Decluttering, DIY, Styling, and Bringing More Design your Life. So dust off those design dreams and let's get started! Declutter. You are going to love this. Really. Decluttering is the #1 way to improve the appearance of your home. The number one way. It is also the least expensive–it’s basically free–so what could be better than that? Based on that, you pretty much have to put it on your 2016 must-do list today. Trust me, it’s transformative. I totally love Kondo’s simple decluttering philosophy: if an item brings you joy, keep it, if it doesn’t, get rid of it. Sounds harsh and radical I know, but will be amazed how great it can look and feel. For an item to bring me joy, it generally means I like its appearance or the way it’s presented. So I added the idea of styling while decluttering to get maximum benefit from this effort, which does take time to do it right. I suggest picking a few areas instead of tackling your entire house at once, and scheduling some time to do them-that way you are more likely to stick to it. 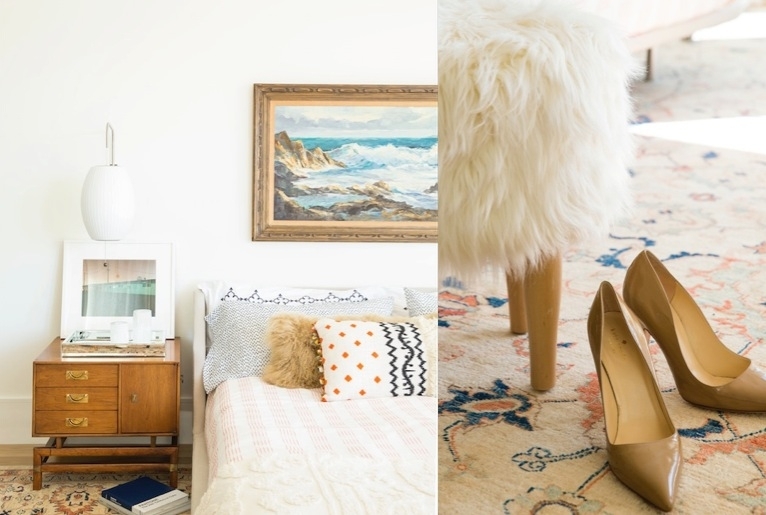 Here are two big-impact areas to declutter in the next few weeks that I guarantee will not only transform the look of your home, but also make you feel better as well. 1. Declutter your kitchen counters, drawers and cupboards. Yeah, we started big. Aside from a remodel, having clutter-free countertops and cupboards with a consistent look is the easiest way to have a beautiful kitchen. Something amazing happens when you totally clean out, simplify, and beautify your counters and cupboards whether you can see what’s inside them or not. Somehow your whole kitchen feels more stylish, your food tastes better, and you want to be there more. For me, this process was about radical simplification of the kitchen. 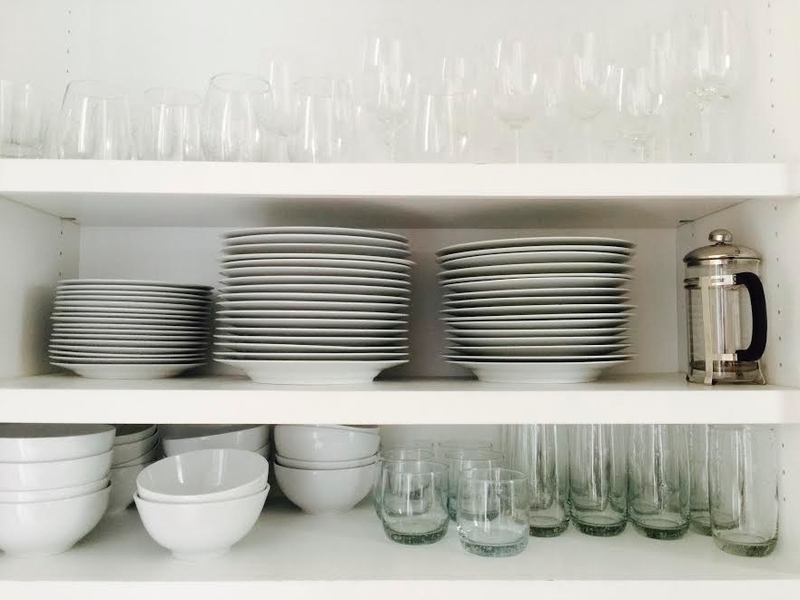 First, I Identified things that we used on daily basis— flatware, dishes, utensils, pots, pans and appliances, and anything that was outside of that got moved out (joy) or removed altogether (no joy). Those items that were moved out were still accessible, but stored away and not in the daily fray of the kitchen cupboards. I figured if I really missed something, I would dig it out. Lastly, I added some styling. I already had white dinner plates, but had accumulated a bunch of mismatched glasses, small plates and bowls of various colors and textures. I got rid of all of them (hello, Goodwill) and focused totally on white and clear glass, and only the essentials: dinner plates, salad plates, bowls, short glasses, tall glasses, wine glasses- that’s it. It has been about two months since this project and I am very pleasantly surprised with how the decluttering is holding up. So much so, that I’m going to walk downstairs to my kitchen and show you what my cupboards look like at this very moment. There was no editing or rearranging of anything before this photo (and of course I was desperate to straighten those bowls and inch that coffeepot over)! Because there are so a few choices of items or where to put something, my kids (and my husband and I) actually put things away in the right place. I found that my family has become invested in the outcome as well: they are thrilled they can find what they’re looking for. I actually found my 10-year-old son straightening a stack of bowls the other day! Next came the counters. My counters were already pretty clutter-free because I’m pretty militant about that, but there were a few stray items that had managed to find a home there that I now had room to put away. Above is my kitchen, and while the counters stay pretty clutter-free, my next project is figuring out how to keep all the papers, backpacks and toys from taking over which they do on a regular basis. Stay tuned. 2. Streamline your bookshelves. Let them tell a great story. Yours. Your bookcases and shelves should tell a story, and be a combination of function, style and meaning. 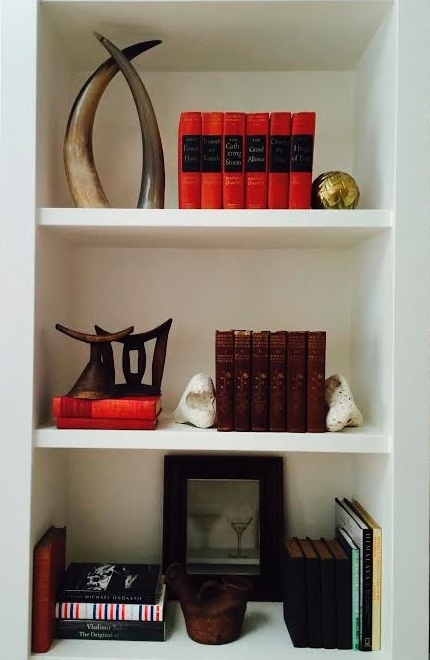 Below is one of my bookcases I recently decluttered and styled. First, I removed everything-really-everything. Then, I grouped things in terms of purpose, color or just because they looked like they belong together. I went on a scouting mission and took things from other areas of the house if they worked and got rid of things that did not. I combined a number of personal items, sculptural objects and books to create something visually balanced and interesting to look at. The top two sets of books are from my husband’s great aunt Bobbie, who was an avid read and world traveler. The African headrest on the middle shelf came from our honeymoon, and the two pieces of coral acting as bookends we gathered from a recent trip to Hawaii with my mom. Below: My youngest son really loves plastic army men, so much so that he puts them all over the house, he hides them in fact. After I had de-cluttered and rearranged the bookshelves, I think he picked up a few pointers from watching me, and I found he had added his own styling to them! I, of course, left his masterpiece there. Do more DIY Projects. They are good for the spirit. And your bank account. There’s a reason to do DIY projects that goes beyond the project outcome of a new pillow, piece of art, or other decorative item: I think it brings you closer to the design process and gives a better understanding how things are made. Making things helps all of us appreciate process and great craft when we see it. It can also be a big stress reliever because it is all-absorbing in the best way possible. Worth a try? 3. 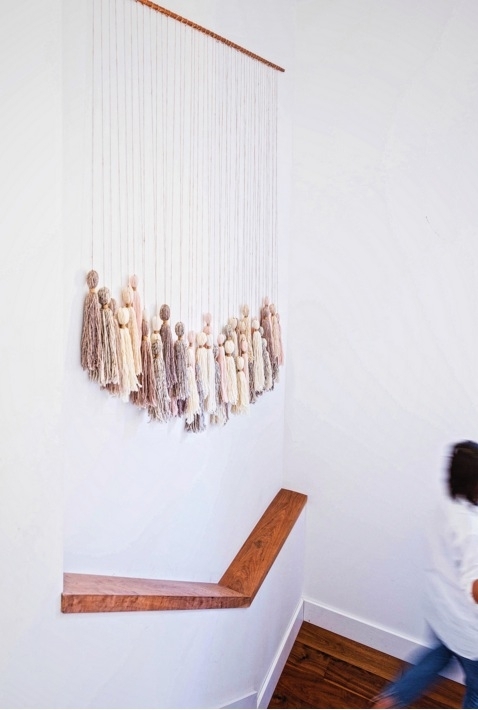 Make a tassel wall hanging. Seriously. Stay with me. 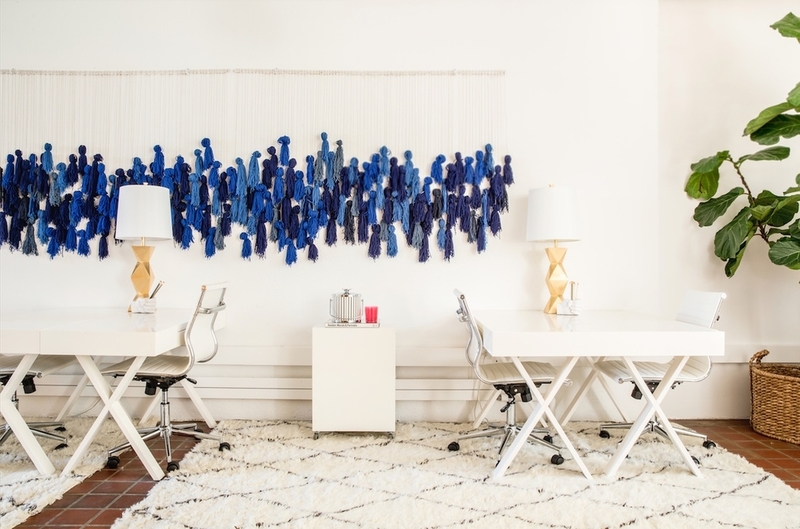 I am now pretty obsessed with tassel wall art our HQ designers created for our office. They got totally inspired after visiting the West Coast Craft Fair, and came home with a plan. I have to admit, I gave Ashley and Jess, our fabulous head of design and design manager, some flack during the process, because I couldn’t understand how a mountain of yarn could turn into such an amazing piece wall art. They said, “trust us,” so I did- I know better by now. Above is the result, and it couldn’t be more stunning or easier. It’s even better in person. Erica Chan of HonestlyWTF came by to check it out and created her own version, which is below. I have to say, while I love the blue for our office, Erica’s color selection was sublime and absolutely perfect for a home stairwell. She gives a full , and she has lots of other great DIY ideas there as well –don’t miss it. Have an empty stairwell? You need this. 4. Paint a light fixture. Low effort. Big impact. You will feel really clever. When we recently redid our master bath, we wanted to create a light and serene escape, so we specified light marble tiles for the entire bathroom and white paint. To add visual interest, we decided to mix in gold to the chrome faucets and fittings. 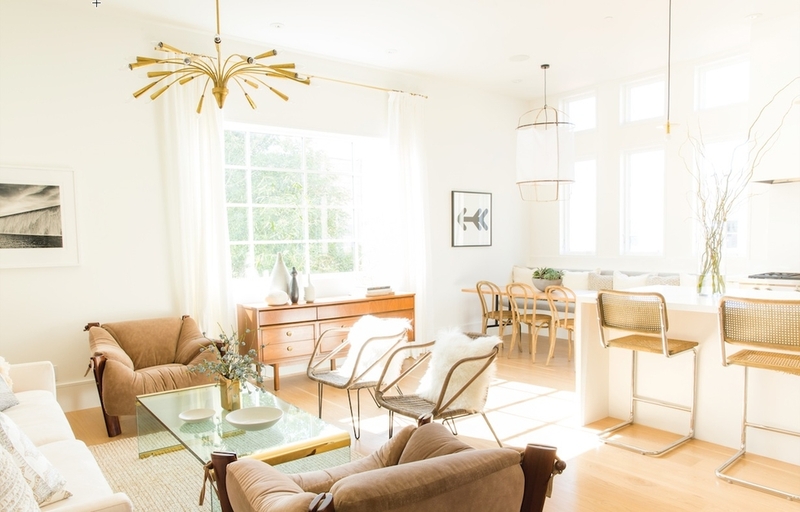 We added brass sconces, and really wanted a brass or gold light fixture. 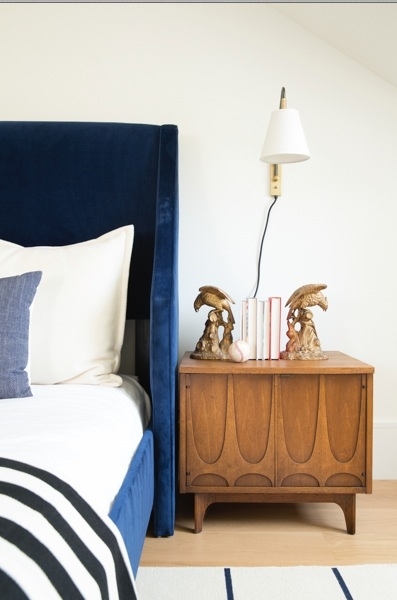 When my Decorist designer Chrissy found the perfect fixture, it was in pewter. Undeterred, I ordered it, declaring I would paint it! Chrissy was somewhat skeptical but encouraging, and to be honest I wasn’t sure how it quite was going to work, but I figured it would be fun regardless, so I gave it a go. I bought the perfect gold paint hue, some her small brushes, a can of matching gold spray paint and went work. See that big capiz shell globe fixture above hanging in the center of my bathroom? It used to be a dark pewter color. That’s what I painted, and I’m really happy with the results. After prepping the surface, I used a small brush and metal paint to outline around the shapes, and then I spray-painted top canopy and cords so they all matched. I was so happy in fact I started painting other light fixtures, and haven’t stopped! It’s a great way to easily change the character of something. Just make sure you prep the surface, get the right paint, and only do external areas that don’t touch sockets or bulbs, or anything that could heat up. 5. Create your own photography art. Show off your great eye. This is a project I have not yet done, but I have been preparing to do for years! I am always taking photographs with the intention of blowing them up and creating wall art. I was particularly inspired by the gallery wall that one of our designers recently created in my daughter’s room below. My 2016 DIY art goal is to create two statement pieces for a few empty walls that are tired of being empty. What’s yours? Learn the art of styling. No school required. Everyone’s style is different, so styling is going to be different for everybody as well. Having said that, there are a few principles to follow when styling something that anyone can apply. Styling, in fact, shares a lot of the same ideas as de-cluttering. 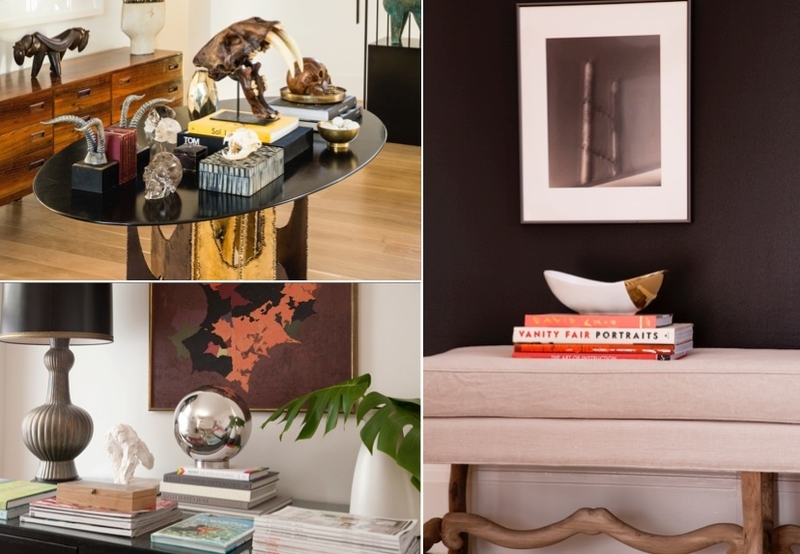 Often, when you style something, you take all of the items off or out, and put back carefully picked groupings of items and art, one at a time. If it works with the other items, keep going, if it doesn’t, keep switching it out until you find something that does. 6. Best stylist trick ever? Use nature: zero cost, super easy. By nature I mean anything that is natural that comes from the outdoors: plants, branches, rocks, shells, nests, pine cones, moss, empty bird nests—the list is endless, and is something you will be continually inspired by—at home and when you travel. 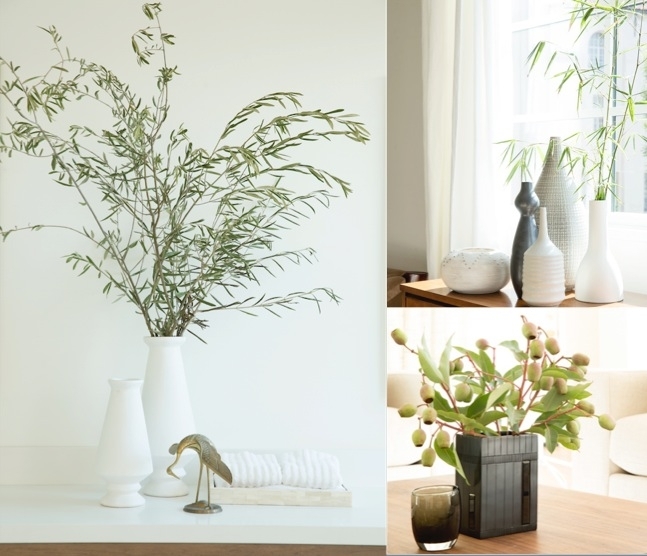 Every home needs fresh greenery, it has such a transformative effect on a room, and it's as simple as walking out your door. All the images above are in my home and all the greenery was taken from my garden or nearby areas. Grab and snip anything from your garden for a two minute green refresh. If you want to get fancy, add some flowers from your garden or nearby store. 7. Restyle your photos. Your family will thank you. I love having photos of family and friends around the house. I also love going to other people’s houses and looking at their photos family and friends: it is such a great way to get to know somebody and share the people in their lives. What I do not love is the way people usually display photos—whole bunch of mismatched frames randomly strewn all over. It really brings down the whole effect, because the eye is more focused on the frames than anything else, and trying to make sense of all the different shapes and colors. And it makes the room look really cluttered. Solution? 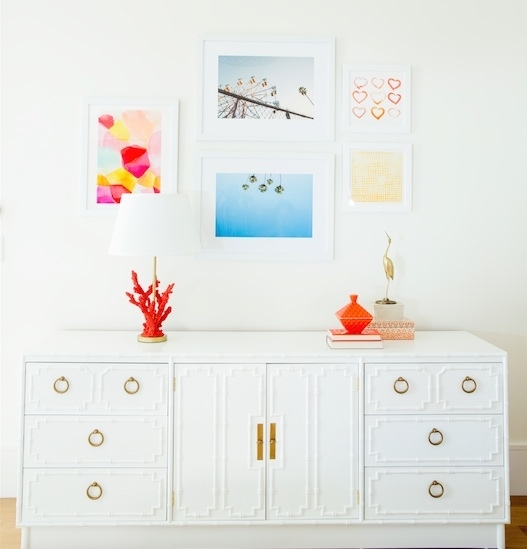 Choose low impact frames, and keep your color scheme consistent. I particularly love the really thick lucite frames in my sitting area above—they really let the photos stand out and they blend beautifully into any style of décor. If you’re working with pre-existing wood frames, the trusty spray paint technique works really well. White brown, black, color, metallic are all good possibilities. The other thing I like to do is to keep the tone of the photos similar within a room—black-and-white, sepia or color. You can now print or have printed nearly any photo in any of these tones. Love the photo but don’t want to change the tone? Keep it of course! but consider moving it to another room where the tone is more consistent with photos there. You also don’t need to frame just photos: any art project that is visually appealing, or plain pride-inducing, deserves a frame. In this photo above of my son's room, we framed his “you're awesome” diploma. 8. Re-accessorize a room. This is design diva time. If you want to dramatically change the look or function of your room and really keep your budget down, re-accessorizing is the way to go. Below is our guest room, and it uses the furniture from our old master bedroom, which used to be all monochrome light beige. 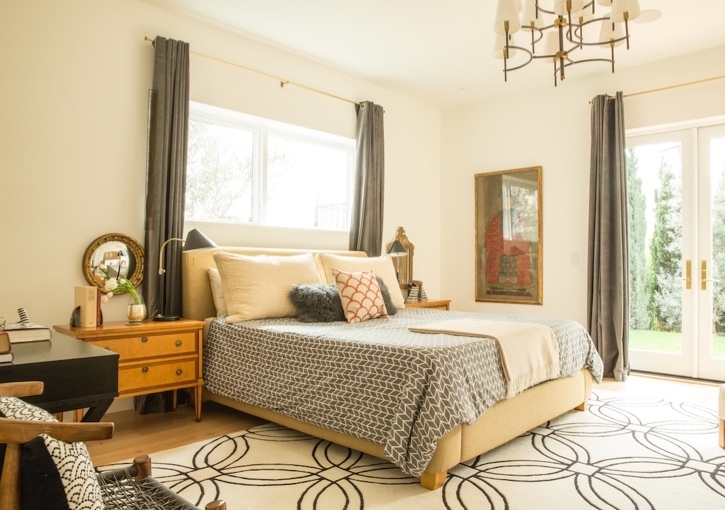 We wanted our new guest room to feel like an international, eclectic retreat, which required a whole new look. Not wanting to spend a lot on our new look we enlisted a Decorist designer to see what she could come up with by using our old furniture and re-accessorizing. The result is above, and we are thrilled. Our designer chose a rug from Overstock, drapes and lights from West Elm, a duvet from Target (yup), and a few great pillows from Etsy. A total transformation for very little. We couldn't be happier with the room which was just featured in Cottages & Gardens magazine! Proof that you do not need to spend a fortune to get a magazine-worthy look. 9. Buy books, books, books. And not just for the coffee table. 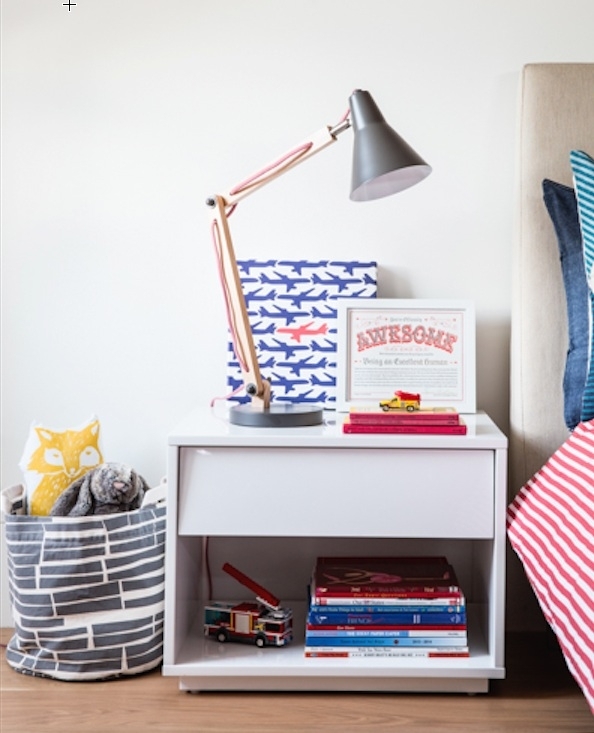 Books in all shapes and sizes are critical to styling a home. Not only do they look great and have a unique ability to pull accessories together, but they also have a fabulous functional purpose. You almost can’t have too many books, and you will be amazed how they get sucked up by a room’s design needs very quickly. So you need a lot. Above: Images from my house showing that books work in all shapes, colors, sizes and rooms and play a key role in design—definitely not just for the coffee table. Below, books look great everywhere, a few images from my son's room, my bedroom and my daughter's room. Tell your friends you are collecting hardcover books, you'll be amazed what they will send your way! Add more design to your life. The one recommendation to consume more that will actually make you look good. Adding design into your life is easy. Below are a number of fun and simple ways to up your design diva quotient without changing your lifestyle. 10. Do a little design every day. OK, every week. You know how they say to do a little cleaning every day to keep on top of tidiness? Well, I say do a little design every day, and and pretty soon your home is magazine-ready. For practice makes perfect: the more you rearrange, remove and style, the better you are at it. Plus, it's a whole lot more fun than cleaning. 11. Help a friend style something. A great way to hone your style and skills is to help somebody else. Go to a friend's house and help them style bookshelf or coffee table. It will take you out of your normal environment and working with new items gives a fresh perspective and lets you see things in new ways. And an added bonus, your friend will love you for it. 12. Spend more time on Instagram. Instagram is such a great design escape. Pick who you follow carefully, and if anyone you follow has 2-3 days of a bad run, unfollow them-life is too short for bad design inspiration. Your Instagram feed should be your ultimate design inspiration. Be sure to follow to Decorist on Instagram, I think we have a fabulous feed @decoristofficial Stay tuned for a list of top 50 Instagram design sites. 13. Visit the flea market, a vintage store or an estate sale. I think it's important to look at antique and vintage furnishings and decor to understand design. Also, using one-of-a-kind items in your home are one of the best ways to add unique style and a designed look to your home. Personally, I adore getting lost in a huge antiques or vintage store. I can go around and around for hours, it's like shopping but not buying anything. Take photos of things that inspire you for whatever reason and keep a file- it will help you hone your sense of style. You can also look back and marvel at all the crazy things you liked once. Flea markets can be even better because there is a sense of urgency to them. Plus the churro thing. Estate sales can be even crazier, and are very cool because there's a whole life story to be told at each one. Be sure to bargain at both, it's expected. 14. Cook a recipe with your family. While cooking doesn't seem like it's design-oriented, it really is. The art of preparing and serving a meal has a lot of design aspects to it, and many of the principles of styling accessories apply to food. Keep it clean and simple, make it interesting. If it looks delicious, is it probably will be delicious. Bringing your family into the fray helps everyone up their style game, and they might like it better than rearranging a bookshelf. 15. 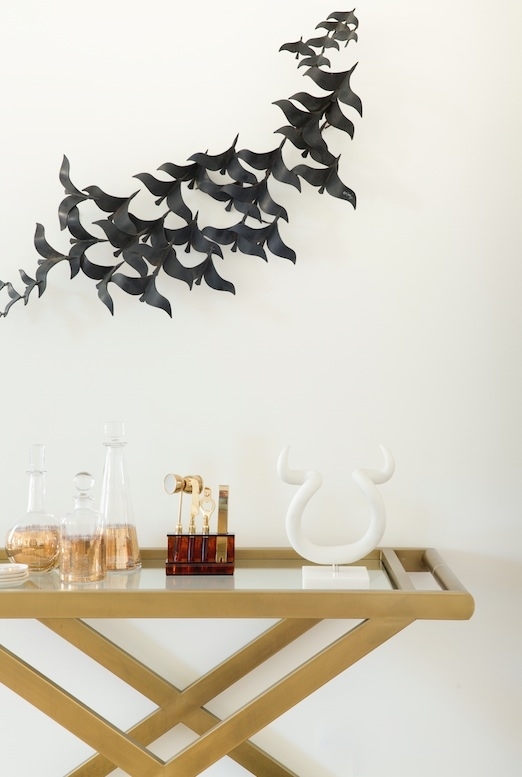 Ask a Decorist designer. Did you know that you can ask a Decorist designer to help you with a design dilemma, find a perfect product, recommended paint color or any other burning design question? Did you know it's free? Yup, it's true, and I think it's a service you will love (I do, I use it all the time!) Just click the link here, and ask away. You can upload photos from your phone or computer to help your designer with your question. Within a day, you will get the answer directly from your designer that includes a personalized design board with recommended products. How great is that? Why do we do this? We do this because we know you will have many design questions over the course of the year in your home, and we want you to think of us whenever you do. We think that if you love our help with the smaller questions, you will certainly enlist us whenever you have a bigger room project. Full Decorist design packages start at just $199 per room. 16. Relax and enjoy your masterwork. The point of decorating and design is to create a beautiful and inviting environment-one where you and your family and friends can relax. You spent time, energy and mindshare getting your home to look great. Make sure you take the time to enjoy it. Shake up a great cocktail, or pour a glass of wine (or whatever works for you), and cheers to all of your efforts. Be sure to invite a few friends to show off your brilliant handy work. I hope these ideas have started you thinking about bringing more design into your life. Designing your home is meant be fun and inspiring, as it helps you create an atmosphere In which to live your best life. Cheers to a beautiful 2016!